Reactor Application is the easy-to-use, high-end graphical user interface of ChemAxon's Reactor. This GUI allows you to reach all the functions of Reactor without the need of using the command-line with parameters. 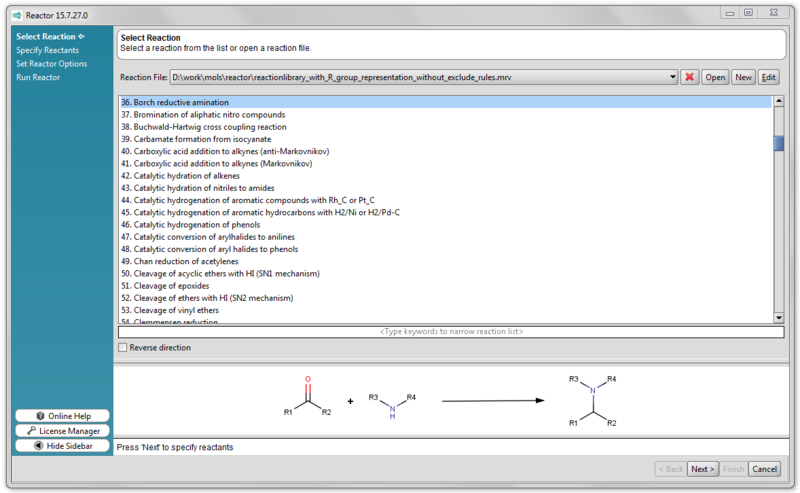 Reactor provides a handy way to process virtual reactions that rapidly generates compound libraries; moreover, reactions containing rules defined in the Chemical Terms language can provide synthetically feasible products. Reactor is bundled in the JChem suite. The typical installation of JChem creates shortcuts to Desktop or to the Start Menu on Win32, Win64, Unix or Mac / Java 2.